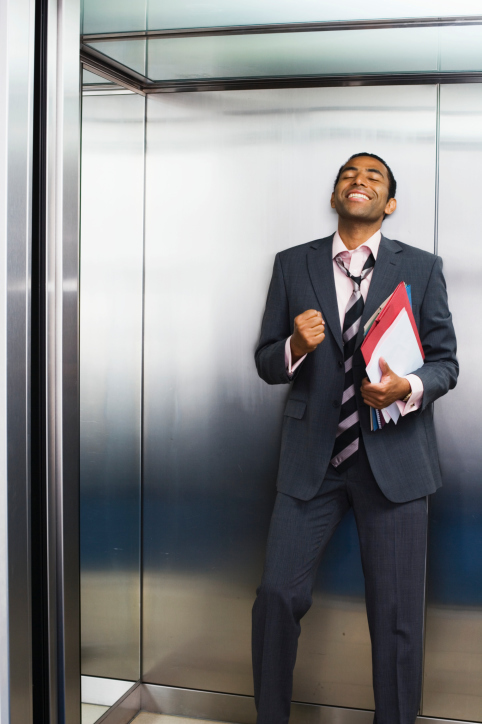 Guide to job hunting: Get your Elevator Pitch sorted out! “Tell me about yourself ….” How often is this question asked in job interviews?! It appears in most of the “Worst interview questions” lists. But simplistic, general and non-specific as it is, its is also a clever question used by the astute interviewer to assess a myriad of selection criteria. Especially when attention to detail, getting to the point quickly and focussing on what is important, appear high on the selection agenda. This question is usually asked at the start of the interview. With this in mind, there are ways to prepare for it properly, so that you can get into the more detailed parts of the interview. Answering it well will make a good impression early on, but waffling and getting it wrong might shoot you in the foot totally, or set you back apace. Getting an Elevator Pitch is a good way to approach this. Wikipedia defines an elevator pitch as a short summary used to quickly and simply define a product, service, or organization and its value proposition. The name “elevator pitch” reflects the idea that it should be possible to deliver the summary in the time span of an elevator ride, or approximately thirty seconds to two minutes. So you have now become your own product, with features and benefits relevant to the job specification! There is also a strong likelihood that the follow-on questions will be based on the way you answer this question. So delivering a strong answer through your Elevator Pitch will certainly assist you in directing part of the interview, or at least give you a chance to introduce yourself fully and mention some working strengths early on in the interview. Obviously! But keep it short. Don’t start way back when, just give very broad brush strokes about the personal stuff because this is a job interview, so you should focus on your working background. But it is good to give a warm introduction to yourself, to personalise the meeting and to display your well-rounded background. Where you studied, what, and why you chose those subjects in particular. Especially if you are an Engineer or if you are being interviewed for a technical job, this is highly relevant. Again, broad strokes are better than finite detail, just give them a flavour so that they can probe it later on. This is where you can direct the interview, to a point. This is really the detail that the interviewer is after and they might interject with questions. Invite questions by talking about your relevant skills or experience. Allow the first question to develop into the rest of the interview as it follow a natural conversational course. 1. Don’t talk about salary at this point. Wait for the question to be asked. 2. Don’t go into unnecessary detail. Value your interviewer’s time. “When I started my recruitment career 24 years ago, I had a set of hanging files containing about 50 candidate records, I knew each one of them and it was my aim to place every single one. Now with the rise of internet based recruiting, agencies have thousands of candidates on their databases and this has contributed to a depersonalisation of the recruitment industry from the candidate’s perspective. There are of course still many Recruitment Consultants out there who go the extra mile to build relationships and feel responsible for their candidates. However, there is always a lot of negative comment about the industry in this area. There seems to be a general mismatch between candidates’ expectations of the recruitment industry in general, and the reality of their day to day experience. Agencies do not find people jobs, they search for potentially suitable candidates to fulfil their clients’ hiring expectations. The recruitment industry is hugely KPI and sales driven, so agencies are under pressure to perform. You will certainly still be able to find specialist consultants who are willing to give you personalised advice and assistance, but don’t set your expectations too high in terms of the success rates of your applications. Take charge of your own situation, give yourself the broadest possible exposure and don’t wait for them to call you – You will have to do most of the chasing! Read the job advertisement and if you don’t fulfil the criteria, don’t apply. If you just apply to every single job you see, you may eventually be seen as an unfocused candidate and could even be taken off the agency’s database. Keep track of the jobs you apply to via the web. Agencies often advertise the same role on different sites, so if you have already applied through one site, do not send your CV again through another. You will save yourself time, your expectations will be managed and you will not create the impression of being desperate. Choose 3 or 4 agencies that operate in your specialist area, and make contact with an experienced consultant. It is better to deal with specialist agencies rather than generalists, as this reduces the level of risk in your application. Introduce yourself to the consultant, explain what you are looking for and ask their advice. Also check how frequently they want you to check in with them for updates, and then make it a habit to have a quick catch up without becoming a pest. Remember, they are targeted and don’t have time to speak with you unless there is a real reason. You want to make sure you are first in their thoughts and on their database for the right reasons! Cathy shares her views on life, job hunting and the UK recruitment industry. There may be a few references to yoga too! And mindfulness, stress management and cognitive behavioural approaches to making life easier and job hunting more successful. She will be very happy to hear your views on what she produces here! Ode to @KwikFit – Knights in oily overalls! Is #LinkedIn turning into Facebook or an online dating site? Or are people just #confused? Looking for a new #job? Here’s how to get started!